In contrast, Israel’s enemies have always fought as alliances, whether the formal military alliance of front-line Arab states that took part in wars of ’48, ’67 and ’73, or the informal political-military alliances behind irregular armies like Hezbollah. 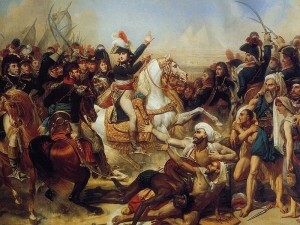 And, as Napoleon discovered time and time again, the joint decision making inherent in a military alliance frequently robs allied armies of their ability to act flexibly or respond quickly to take the initiative, making them vulnerable to nimbler opponents under more unified leadership. Keep in mind that Napoleon’s enemies at least had a common goal of stopping his conquest of Europe, which meant the French Emperor had to exploit subtle divisions in each of his “united” enemy’s political and military situations and leadership. In contrast, Israel’s “allied” enemies have been at east other’s throats for the better part of a century, with cultural antagonisms rooted in religious sectarianism and tribal conflict going back far longer. This has only enhanced the ability of Israel’s small but united force to defeat the far larger but disunited forces arrayed against her time and time again. Given these odds, Israel and her friends have wisely chosen to avoid direct confrontation and instead turned to their US ally to veto any anti-Israel initiative taken at the UN that might have binding legal authority, thus neutering the enemy’s advantage in this important theater. Such a strategy represents a classic flanking maneuver that resists the temptation to directly attack where the enemy is strongest in favor of clever tactics that make an opponent’s numerical superiority irrelevant.